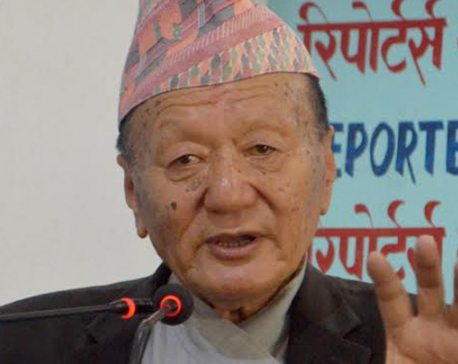 KATHMANDU, Dec 26: Minister for Labour, Employment and Social Security Gokarna Bista has stated that the government was committed towards effective implementation of the equal work and equal pay. 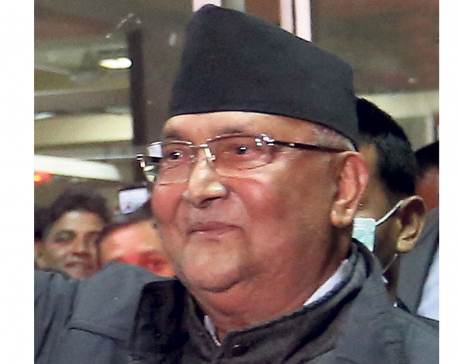 KATHMANDU, Dec 18: Prime Minister KP Sharma Oli has said that the country would achieve economic prosperity with the labor of skilled and capable workers. 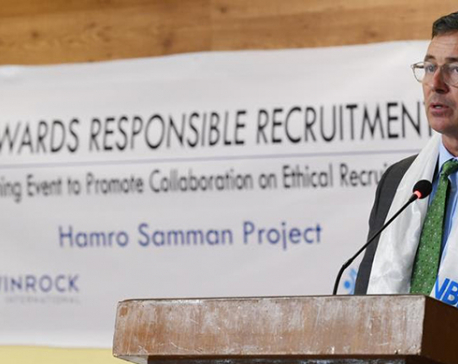 KATHMANDU, Nov 20: Experts, representatives of the Government of Nepal, the private sector, civil society, and development organizations have all emphasized fair and ethical foreign employment process at a function organized in Kathmandu on Monday. 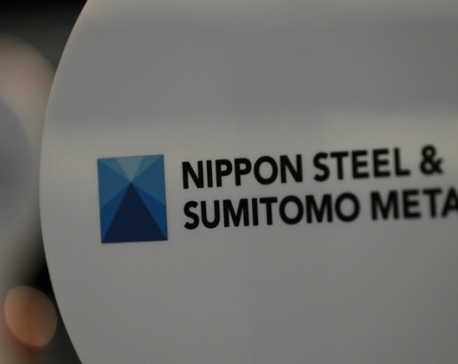 SEOUL, Oct 30: In a potentially far-reaching decision, South Korea’s Supreme Court has ruled that a Japanese steelmaker should compensate four South Koreans for forced labor during Japan’s colonial rule of the Korean Peninsula before the end of World War II. 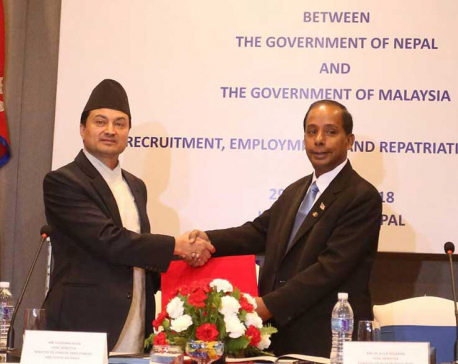 KATHMANDU, Oct 29: Minister for Labor, Gokarna Bista, and his Malaysian counterpart M. Kula Segaran has signed a labor deal amid a function at Hotel Hayat today. 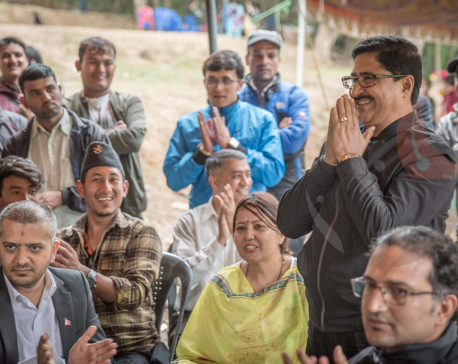 KATHMANDU, June 12: Minister for Labor, Employment and Social Security Gokarna Raj Bista today said Nepal would be rid of child labor in the next seven years. KATHMANDU, May 25: Joint-secretary Rupnarayan Bhattarai, who played a crucial role in crushing the transport syndicate, has been transferred to Ministry of Labor and Employment. Despite criticism from all walks of life, Physical Infrastructure and Transport Minister Raghubir Mahaseth had recalled Bhattarai to the ministry from the Department of Physical Infrastructure and Transport. KATHMANDU, May 1: The Circulation Department of Nepal Republic Media has organized a picnic program at Godawari, Lalitpur on the occasion of International Labor Day, today. 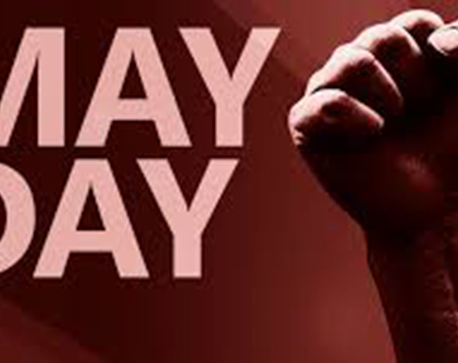 KATHMANDU, May 1: Today marks the 129th Labor Day. It is also known as International Workers' Day in some countries. It is a celebration of laborers and the working classes that is promoted by the international labor movement, socialists, communists or anarchists. 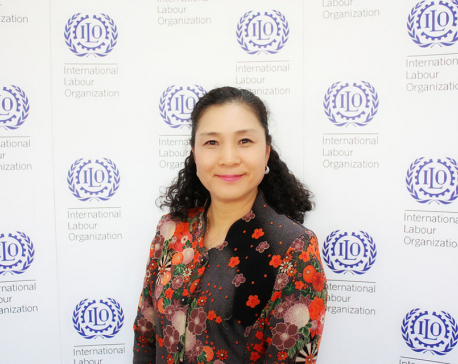 KATHMANDU, April 27: Assistant Director General and ILO Regional Director for Asia and the Pacific Tomoko Nishimoto says ILO marks the World Day for Safety and Health at Work (SafeDay) and the World Day against Child Labour (WDACL) together this year to improve safety and health of young workers in a bid to end all forms of child labour by 2025. Tula Bahadur Rokaya, 42, is a laborer from Jajarkot. 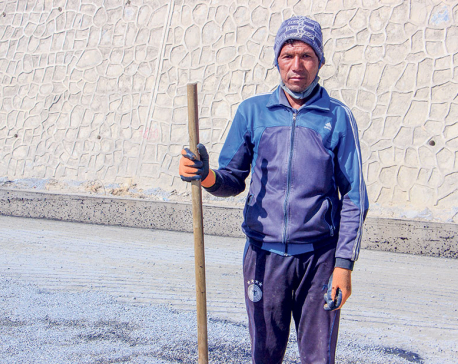 He had arrived in Kathmandu a few months ago to work as a daily wage laborer for the ring road construction project. NUWAKOT, Jan 5: Upendra Adhikari of Chogade village in Nuwakot had started constructing his house right after the Dashain festival. 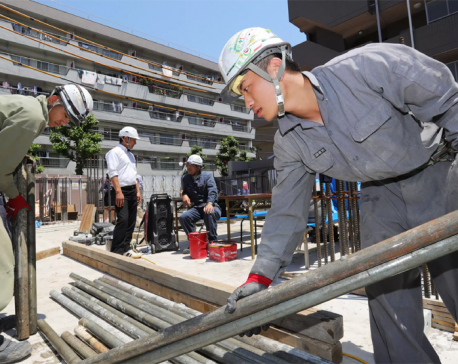 The earthquake victim had gathered materials for the building well in advance. He had planned to get it built within six months. However, so far, not even twenty percent of the work has been over, he laments. KATHMANDU, Dec 21 : Hundreds of thousands of women migrant workers in the Middle East have signed employment contracts that they do not understand or do not adequately protect them against discrimination and abuse, according to a recent study carried out by UN Women and the International Organization for Migration with support from the Swiss Agency for Development and Cooperation. The news these days always has cases or incidents of death, migrant workers’ plight, and of their family members being left in the lurch. Despite of the repeated occurrence of these incidents, the number of aspiring migrant workers is increasing every year. 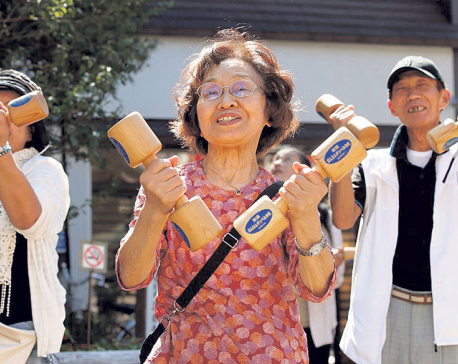 Swinging dumbbells and chewing gum, several elderly Japanese gathered at a shrine in downtown Tokyo on Monday in sweltering temperatures, belying their age and importance in one of the world’s most rapidly aging societies. RAUTAHAT, August 13 : In a tragic incident, six persons died after an ambulance ferrying a pregnant woman in labor pain was washed away by the floods in Rautahat district at around 4 am on Sunday. 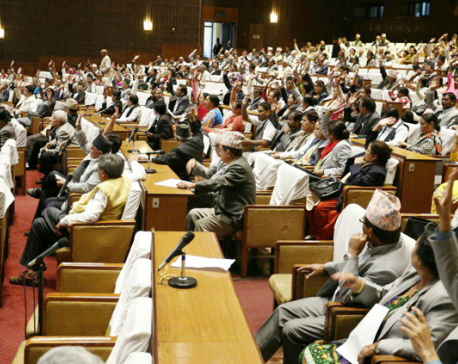 Kathmandu, August 11: The meeting of the Legislature-Parliament today has approved Labour Bill-2074 BS. Minister for Labor and Employment Farmullha Mansur had presented the bill in the House. KATHMANDU, August 11: Parliament on Thursday endorsed a third bill related to the replacement of the Muluki Ain, introducing parole and open jail systems for the first time in the country, and paving the way for authorities to put inmates to public labor and social work. KATHMANDU, July 2: Minister for Labor and Employment Farmullah Mansur has expressed the government's seriousness to resolve the problems of laborers. KATHMANDU, June 12: A rally was held on the occasion of the 16th World Day Against Child Labour here in the capital city this morning. KATHMANDU, May 1: Industrialists and trade union leaders are hopeful that the endorsement of Labor Bill and Social Security Bill by the parliament will improve relation between employers and employees. 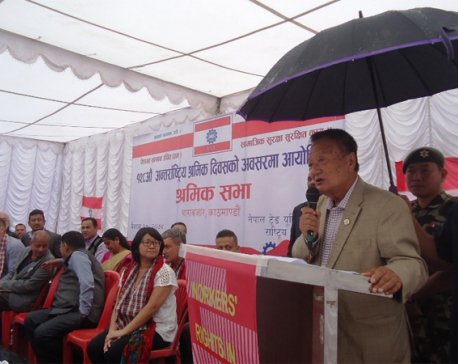 KATHMANDU, May1: Minister for Labor and Employment Surya Man Gurung on Monday has said the legislature-parliament is set to pass Labor Act and Social Security Act in the immediate future. KATHMANDU, May 1: Monday marks the 128th Labor Day. It is also known as International Workers' Day in some countries. It is a celebration of laborers and the working classes that is promoted by the international labor movement, socialists, communists or anarchists. 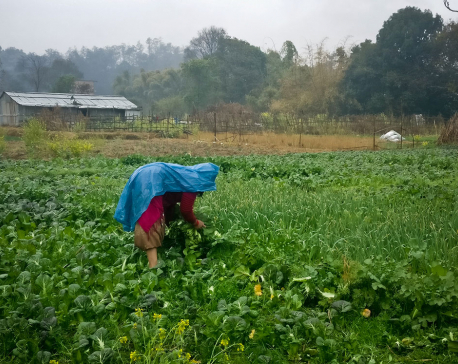 KATHMANDU, Feb 14: The International Labor Organization (ILO) has launched a project 'From Protocol to Practice: A Bridge to global action on Forced Labor (The Bridge Project)', aiming to combat slavery and forced labor systems in Nepal. CHITWAN, Feb 5: Minister for Labor and Employment Suryaman Gurung has accepted that free visa and air ticket system could not be implemented and managed. KATHMANDU, Dec 19: Minister for Labor and Employment Suryaman Gurung spoke of the need of motivating youths to seek employment opportunity within the country. 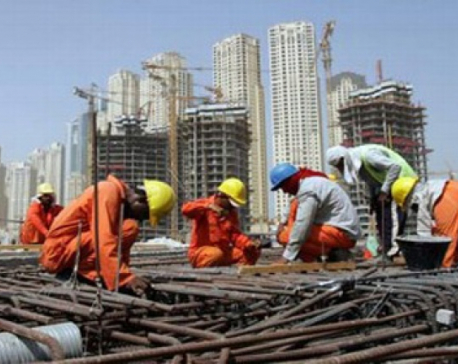 KATHMANDU, Dec 14: Qatar on Tuesday reportedly ended the labor sponsorship system popularly known as kafala, that forces foreign migrant workers to seek their employers’ permission before changing jobs or leaving the country. 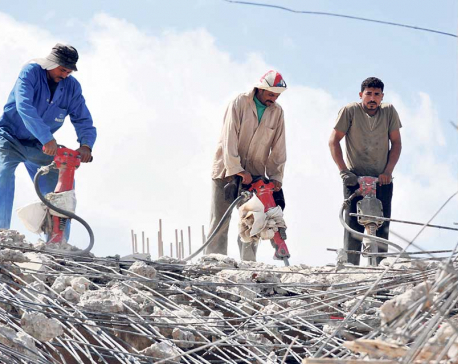 DOHA, Dec 14: Qatar on Monday formally announced the end of its controversial “kafala” system, arguably the biggest ever labor reform undertaken by the host of the 2022 football World Cup. GAIGHAT (Udayapur), Dec 7: The expectant mothers arriving at the District Hospital Udayapur are dumbfounded when they are told that the hospital is facing a dearth of maternity service related doctors for the past two months. KATHMANDU, Oct 22: Nepal has failed to conclude labor agreement with Malaysia and Saudi Arabia, where, according to organizations working on migration issues, thousands of women are being trafficked every year. KATHMANDU, Sept 12: The meeting of the Legislature-Parliament here Monday unanimously approved the proposal tabled, seeking deliberation on the 'Labor Bill-2072 BS'. KATHMANDU, Sept 5: Rescued from bonded labor in India, Ekraj Biswakarma, 15, of Jajarkot district, reached Kathmandu on Thursday, his dream of studying in a boarding school and improving his family's lot presumably shattered. UDAYPUR, July 30: Civil society members and other stakeholders have pointed out the problem of child labor in Udaypur. In an interaction program on the condition of children in the district, stakeholders said that the use of child labor is 'rampant' in market areas of Udaypur, especially in hotels. KATHMANDU, July 11: The Workers Trade Union Federation Nepal has submitted a 15-point memorandum to Labor Minister Deepak Bohora urging to increase the salary of workers by 100 per cent. 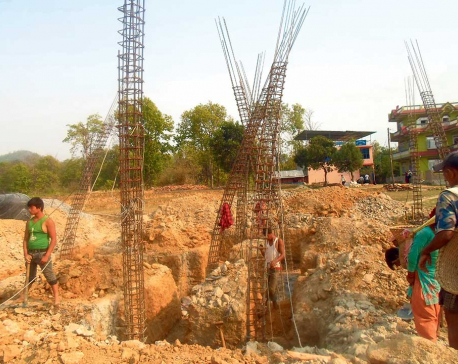 JANAKPUR, June 28: A significant number of unskilled manpower leave the country every year for the global labor market, putting their lives at risk, participants of a program organized here Monday said.